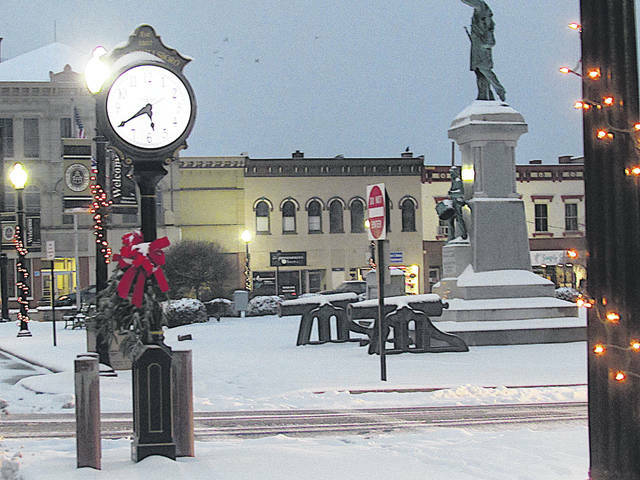 Snow on the courthouse lawn made for a picturesque scene at dusk Saturday, although the winter weather system that brought it caused some mayhem on area roads. A winter weather system that worked its way through the area over the weekend dumped several inches of snow on Highland County, keeping road crews and law enforcement busy with thoroughfares made hazardous by snow and ice. Kathleen Fuller, public information officer for the Ohio Department of Transportation District 9, said ODOT crews were on the road around the clock from 4 a.m. Saturday until 5:30 p.m. Sunday shoveling snow and spreading salt. “We were at full staff until Sunday afternoon,” Fuller said. According to Fuller, ODOT workers used 626 tons of salt and 4,450 gallons of brine in Highland County during the storm. “It was warm enough that we didn’t have to go to calcium chloride or grit,” she said. Snowy roadways contributed to at least seven motor vehicle accidents around the county, according to law enforcement. The Highland County Sheriff’s office reported three accidents over the weekend where vehicles lost control and drove off the roadway, with one striking a tree and sending two people to the hospital. The Ohio State Highway Patrol post in Wilmington reported four accidents over the weekend here sent two others to the hospital with injuries. A dispatcher said one accident, which occurred Saturday morning on SR 124 near North Shore Drive, was a collision between a passenger vehicle and an ODOT truck. One occupant was transported to Highland District Hospital with minor injuries sustained in the wreck, the dispatcher said. James Gibson, a spokesman for the National Weather Service in Wilmington, said the slow-moving weather system brought two bands of snow and a wintry mix through the area Saturday and Sunday. Gibson said areas north of Highland County saw more snowfall, with the NWS office in Wilmington logging 8.1 inches, while some areas in Highland County saw between four and five inches. Fuller said ODOT crews reported as much as seven inches in some spots. Expect another storm system this weekend, Gibson said, since high pressure building in the atmosphere shows signs of further precipitation in coming days. Gibson said it’s too early to tell what type of precipitation or how much is anticipated.